Because her talents are so versatile, Marcia has been commissioned to paint more than 300 pieces of art for clients and designers. From fine art paintings to painted furniture, decorative gourds, indoor and outdoor murals and more, Marcia works directly with each client to provide them with the perfect piece. On this page you'll find some of the most recent commissions Marcia has been hired to create. Marcia was recently commissioned to create a family heirloom by a client who wanted a special Valentine's gift for her husband. When he was younger, he was in a family musical group. His Mother played the accordion, his Father played the guitar and the client's husband played the sax. 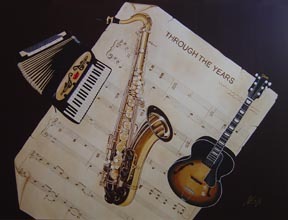 Marcia photographed the actual accordion and sax for reference while painting the piece. The client had the idea of putting a piece of sheet music in the background. When she asked her husband if he had any favorite song he played with his parents, one didn't come to mind. However, he said there was one song that always reminded him of their marriage and life together. His choice of "Through The Years" not only spoke volumes about his love for his wife, but also was a befitting piece for the painting. The painting is 48" x 36" and is acrylic on canvas. The chocolate brown background matches a new sectional the client recently had made for the room. 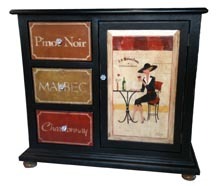 Marcia was commissioned to turn a previously painted chest into a special piece of furniture for a client's family room. Based on the new cabinetry in the adjoining kitchen, the fabulous wet bar in the family room, and other works of art the client's were displaying in the room, Marcia chose a French bistro theme. "This was a really fun project," said Marcia. "I haven't painted a piece of furniture for some time and it is one of my favorite forms of art." The chest was rather rustic with many imperfections in the finish so Marcia decided to give it an aged and weathered appearance. The clients absolutely fell in love with the piece when Marcia delivered it to them. Marcia was commissioned to do two pieces of art for the June 2010 issue of edible Reno-Tahoe magazine. "I love the colors of egg plants and heirloom tomatoes so this assignment was a ton of fun for me," said Marcia. NOTE:The originals as well as prints are available on these pieces. Marcia was recently commissioned by Steve and Jeanie Budija, owners of Bricks Restaurant & Wine Bar in Reno, NV to do this painting of daffodils blooming in the restaurant's flowerbed for their spring lunch menu cover. "This was a really fun project," said Marcia. "It's the first original art I've done for a menu cover and I had a blast doing it. I used acrylics like watercolors and really like the way it turned out." Edible Reno-Tahoe magazine was launched in March 2010 by Amanda Burden, former editor of Reno Magazine. Its focus is the local food and drink scene and features locally grown food products (produce, meats, etc.) and well as local eateries, gardening, etc. Amanda commissioned Marcia to do this piece for the inaugural issue of this dynamic quarterly magazine. "I thoroughly enjoy working with Amanda on the magazine," says Marcia. "And having my art appear in each issue is a real treat and great exposure for my work." NOTE:The original as well as prints are available on this piece. This piece was commissioned as a Christmas gift for a person who is totally into Dolphin fish. It is a 20" X 20" Oil on Canvas. "My son actually ordered this and it was the first time I was ever commissioned to paint a fish," said Marcia. "I was very nervous when I began the painting but am very pleased with the finished piece." "We love the painting. So much so that we don't know if we can give it up now," said her son Jeff with a chuckle. This piece was commissioned by a couple in Virgina who purchased Marcia's Eggplants painting while visiting Reno. It is a 9" X 12" Acrylic on Canvas. "This is the first time I have done a commissioned piece and relied solely on emails to get the client's approval," said Marcia. "It went seamlessly and they are thrilled." 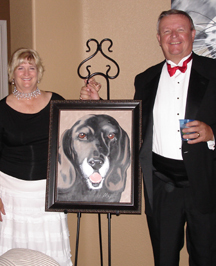 This is an 18" x 24" oil on canvas Marcia painted for Dennis and Cheryl of Reno, NV of their loving pet pooch. Marcia used a photo the couple had as a guide to create the piece. Just for fun, Snoop's painting was unveiled at a recent party at Marcia's home. Dennis and Cheryl went all out for the occasion in their formal wear. "We were absolutely thrilled with the painting when Marcia unveiled it," said Cheryl. "It looks exactly like Snoop." "Seeing it for the first time when Marcia removed the cover was great," added Dennis. "And the unveiling party was a blast." This is a 24" x 30" acrylic on canvas Marcia was commissioned to paint by Alexandra from Sacramento, CA. It was based on a photograph Marcia took in a downtown park when she lived in Indianapolis. "I stopped in to see Marcia when she was doing an artist reception at Coffee Republic in Folsom, CA., "said Alex. "When I saw a similar painting she had done based on a photo she had taken years ago, I just had to hire her to do a painting for me. The lonely park benches combined with the single leaf drifting down just speaks to me. I love my painting and couldn't be happier with the experience of working with Marcia." "I so enjoy working with Marcia when I'm designing a home for a client," says Marsha Burau of Burau Design in Scottsdale, AZ. "I have never worked with an artist so adaptable as Marcia. Rather than finding a painting and then designing a room around it, I am able to design the room based on my client's needs and have the art created to accentuate the decor. My clients also love that they can be part of the process because Marcia provides me with sketches in advance for their approval." Is your home or office crying out for a piece of art and you don't see exactly what you want on our Gallery Page? Marcia has created over 300 custom pieces for discriminating clients. Whether your are a homeowner, business owner or designer, Marcia can work with you to create the specific pieces you desire. Some clients provide their own photos for Marcia to use as a guide, others work with her to develop a concept and design that compliments the decor of their living or working space. You may contact Marcia directly to schedule a meeting. There is no charge for the initial consultation. Marcia will bring her portfolio so you can see many of the custom pieces she has created for others.